One billion years from now, about 27% of the modern ocean will have been subducted into the mantle. If this process were allowed to continue uninterrupted, it would reach an equilibrium state where 65% of the current surface reservoir would remain at the surface. Once the solar luminosity is 10% higher than its current value, the average global surface temperature will rise to 320 K (47 °C; 116 °F). The atmosphere will become a "moist greenhouse" leading to a runaway evaporation of the oceans. At this point, models of the Earth's future environment demonstrate that the stratosphere would contain increasing levels of water. These water molecules will be broken down through photodissociation by solar ultraviolet radiation, allowing hydrogen to escape the atmosphere. The net result would be a loss of the world's sea water by about 1.1 billion years from the present. This will be a simple dramatic step in annihilating all life on Earth. There will be two variations of this future warming feedback: the "moist greenhouse" where water vapor dominates the troposphere while water vapor starts to accumulate in the stratosphere (if the oceans evaporate very quickly), and the "runaway greenhouse" where water vapor becomes a dominant component of the atmosphere (if the oceans evaporate too slowly). The Earth will undergo rapid warming that could send its surface temperature to over 900 °C (1,650 °F) as the atmosphere will be totally overwhelmed by water vapor, causing its entire surface to melt and killing all life, perhaps in about three billion years. In this ocean-free era, there will continue to be surface reservoirs as water is steadily released from the deep crust and mantle, where it is estimated there is an amount of water equivalent to several times that currently present in the Earth's oceans. Some water may be retained at the poles and there may be occasional rainstorms, but for the most part the planet would be a dry desert with large dunefields covering its equator, and a few salt flats on what was once the ocean floor, similar to the ones in the Atacama Desert in Chile. With no water to lubricate them, plate tectonics would very likely stop and the most visible signs of geological activity would be shield volcanoes located above mantle hotspots. 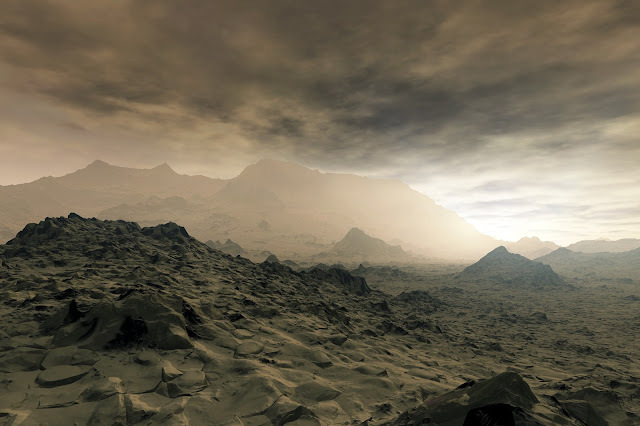 In these arid conditions the planet may retain some microbial and possibly even multi-cellular life. Most of these microbes will be halophiles and life could find too refuge in the atmosphere as has been proposed that could have happened on Venus. However, the increasingly extreme conditions will likely lead to the extinction of the prokaryotes between 1.6 billion years and 2.8 billion years from now, with the last of them living in residual ponds of water at high latitudes and heights or in caverns with trapped ice; underground life, however, could last longer. What happens next depends on the level of tectonic activity. A steady release of carbon dioxide by volcanic eruption could cause the atmosphere to enter a "supergreenhouse" state like that of the planet Venus. But as stated above without surface water, plate tectonics would probably come to a halt and most of the carbonates would remain securely buried until the Sun became a red giant and its increased luminosity heated the rock to the point of releasing the carbon dioxide. The loss of the oceans could be delayed until two billion years in the future if the total atmospheric pressure were to decline. A lower atmospheric pressure would reduce the greenhouse effect, thereby lowering the surface temperature. This could occur if natural processes were to remove the nitrogen from the atmosphere. Studies of organic sediments has shown that at least 100 kilopascals (0.99 atm) of nitrogen has been removed from the atmosphere over the past four billion years; enough to effectively double the current atmospheric pressure if it were to be released. This rate of removal would be sufficient to counter the effects of increasing solar luminosity for the next two billion years. By 2.8 billion years from now, the surface temperature of the Earth will have reached 422 K (149 °C; 300 °F), even at the poles. At this point, any remaining life will be extinguished due to the extreme conditions. If the Earth loses its surface water by this point, the planet will stay in the same conditions until the Sun becomes a red giant. If this scenario doesn't happen, then in about 3–4 billion years the amount of water vapour in the lower atmosphere will rise to 40% and a moist greenhouse effect will commence once the luminosity from the Sun reaches 35–40% more than its present-day value. A "runaway greenhouse" effect will ensue, causing the atmosphere to heat up and raising the surface temperature to around 1,600 K (1,330 °C; 2,420 °F). This is sufficient to melt the surface of the planet. However, most of the atmosphere will be retained until the Sun has entered the red giant stage. With the extinction of life, 2.8 billion years from now, it is also expected that Earth biosignatures will disappear, to be replaced by signatures caused by inanimate processes. Guess we don't have to wait that long. I will be the future of aerospace and defense under my future company, The Enterprise! Lets talk about 100 years from now at least.